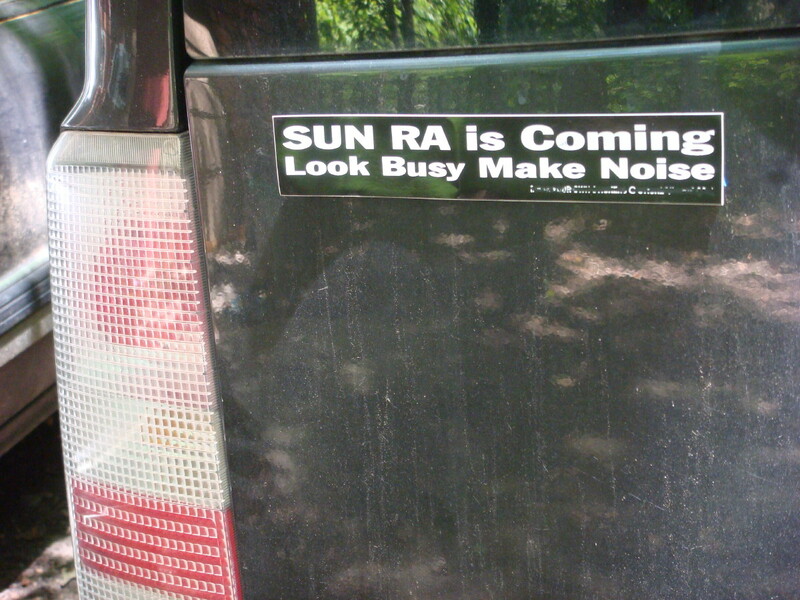 SUN RA IS COMING. LOOK BUSY. MAKE NOISE. As a prequel to the exhibit "Pathways to Unknown Worlds: Sun Ra, El Saturn and Chicago's Afro-Futurist Underground 1954-1968", an exhibit celebrating the career of legendary jazz musician Sun Ra, a spectacle organized by Jim Kellough will be held this Saturday the 8th of August 2009, at the Durham Art Guild in Durham NC. 3pm to 4:30pm - Create a costume at the Scrap Exchange ($5 for access to the materials at the Scrap Exchange). 4:30pm to 6pm - Procession and costume parade from Durham Central Park to the Durham Art Guild at 120 Morris Street. Free. Everyone is welcome, bring your own costume. I have heard rumors the Zombie Lurch contingent may make an appearance. 6pm to 8pm - Music at the Durham Arts Guild Gallery, inside the Durham Arts Council Building, 120 Morris Street. Free. 6:00 - 7:00 A group of improvisers give their treatment to some Sun Ra charts in the Arts Council Building. Including Bo Newsome and Carrie Shull on oboes, Steve Burnett on theremin, York Wilson on pedal steel guitar, Marika Wendleken on bowed saw, and Ben Riseling and m'self on reeds. 7:00 - 8:00 The Triangle Sound Painting Orchestra "
I plan on introducing a Bertiaux element into my Sun Ra tribute on theremin. thanks for reading. Spread the word.